Global trade and travel have enabled many terrestrial and aquatic plant and animal species to become established in new environments where they can pose environmental and economic problems. Because these invaders often have no natural competitors or predator in their new community, they frequently influence the local ecology. In some cases, the invading species establishes itself as the dominant species in an environment, displacing native communities and reshuffling ecological relationships. The effects on local and regional economies can be significant, disrupting and diminishing fisheries, forestry, and agricultural productivity. The following is a brief overview of some of the non-indigenous invasive species present on the southern Oregon Coast and their effects on ecosystems and local economies. Additional and supplementary information is available elsewhere (e.g., Portland State University’s Aquatic Nuisance Species Research and Guide to the Non-native Aquatic Species of Oregon and the Oregon Invasive Species Council. Efforts to improve our understanding of invasive species issues and address their impacts are ongoing so our understanding of the full effects of introductions tends to be incomplete because of insufficient information. Our understanding of the spatial extent for each species, including those present in Oregon’s south coast area remains similarly incomplete. Ship ballast is a global provider of inadvertent introductions of small marine invertebrates. US Coast Guard regulations for ballast water reporting and exchange have existed since the late 1990’s, but these are not required for ships transiting only domestic waters (i.e., staying within the US Exclusive Economic Zone (EEZ), within 200 miles of the coast). These trans-oceanic ships must exchange ballast water in the “open ocean,” or outside the EEZ, where larvae from nearshore-dwelling organisms are unlikely to exist or survive. These relatively new requirements have undoubtedly minimized new invasive species introductions to nearshore and inland bays from overseas. However, ballast exchange is not perfect, and the many already-established populations of non-indigenous species in place along the US coast means that introductions continue to occur, aided by domestic traffic and natural dispersal by ocean currents. In response to these perceived shortcomings in the Coast Guard regulations, many coastal states, including Oregon, have established their own procedural and reporting requirements for ballast water: in addition to the Coast Guard requirements, ships originating from a North American Pacific port must exchange ballast 50 miles from shore before entering any Oregon port (OAR 340-143-0100; see ODEQ 2010 for recent analysis). However, southern Oregon’s Coos Bay is one of the most-invaded ports on the west coast, with at least 67 established non-indigenous aquatic marine species. Thus a significant source of invasive propagules is available in State waters. One marine species introduced to Coos Bay is the European green crab (Carcinus maenus). These crabs are voracious predators that prey upon a diverse range of invertebrates such as clams, mussels, and other crab species up to their own size. European green crabs compete strongly with the Dungeness crab, which comprises a commercially- and recreationally-important fishery in Oregon. Adult European green crabs were found in Coos Bay during 1997 and 1998, but for unknown reasons this species has failed to become well established and is present in relatively low numbers while the Dungeness population thrives. It is possible that the ballast regulations have prevented new introductions and the present population is being contained by predation or physical conditions; however, changing ocean conditions associated with escalating climate change may eventually assist in the spread and establishment of this species through larval dispersal from invaded points to the south (Behrens Yamada et al. 2005). A thriving population of European green crabs in and near Coos Bay would likely cause economic harm to the recreational and commercial shellfish fisheries of the South Coast region as it has elsewhere, from the east coast of North America (Rogers 2001) to Tasmania (Proctor and Thresher 1997). Another recent arrival to Oregon coastal waters is the dreaded tunicate Didemnum vexillum, found in Coos Bay and Winchester Bay in 2010. This colonial sea squirt overgrows and smothers docks, pilings, and biological communities on the sea floor, causing widespread disruption of coastal ecosystems and fisheries. It was found on aquaculture gear in Sitka, Alaska during the same summer, also the first detection of this species in that state. 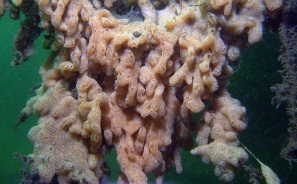 This tunicate can spread through budding and fragmentation as well as by sexual reproduction; thus both cleaning and transportation of aquaculture gear likely contribute to its spread. Oyster culture is big business on the western coast of North America, and encrusting organisms and algae thrive on the additional surface area provided by gear and shells associated with these activities, to the bane of the shellfish growers. Aquaculture is only one means of spread, however, and the costs associated with the additional workload imposed by D. vexillum and its negative effects on growth of cultivated shellfish are a significant economic impact to this industry. Boat hulls, whether they belong to large freighters or recreational skiffs, provide a first-class seat for many hangers-on, especially sessile invertebrates (including tunicates such as D. vexillum.) In the freshwater realm, zebra mussels (Dreissena polymorpha) are another species poised to invade Oregon, and recreational boat hulls are likely vectors. Zebra mussels disrupt stream-bottom ecology by settling densely and altering plankton supplies to native organisms that manage to persist. Zebra mussels are native to the Black Sea and Caspian Sea region of Eurasia and first arrived in North America in 1988, spreading rapidly via waterways and causing millions of dollars of damage to infrastructure in the Great Lakes. Since being detected in California in 2008, the State of Oregon has set up voluntary boat inspection stations where at least two instances of stowaway zebra mussels were removed during summer 2011. While zebra mussels have not yet been detected in Oregon waters, their presence would likely alter habitats and plankton communities much as they have elsewhere, overgrowing other encrusting organisms in large numbers; Oregon and other Pacific Northwest states should continue to be vigilant and keep this organism out of their waterways and avoid the tremendous economic impacts this species has had elsewhere. Other invertebrates of concern to land managers on the southern Oregon coast include the almost imperceptible arrival and spread of two tiny snails in the brackish and freshwater portions of the Coos estuary: the New Zealand mud snail (Potamopyrgus antipodarum) and the Asian marsh snail (Assiminea parasitologica). Though the effects of these invasions are still being studied, the speed with which these species are spreading is alarming. § AP was found in highest concentrations in Isthmus Slough (approximately 750 snails per half square meter) and the lowest concentrations in South Slough (detected at only one site). § Though found mainly in brackish waters, AP was also found estuarine areas subject to wide salinity ranges. § AP was found in all intertidal marsh types and elevations, and in all different intertidal marsh plant communities. § The data from the survey strongly suggest that AP could displace native snail populations. 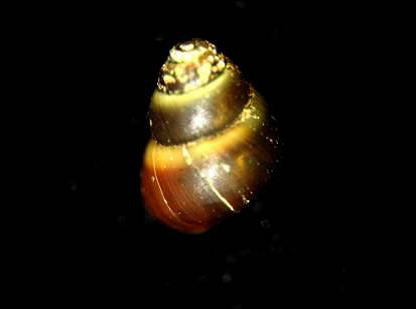 The New Zealand mud snail (mud snail) is reported present in freshwater streams throughout Oregon. In Coos Bay, it has been reported at the Doris Place boat launch and in Catching Slough. It has not yet been found in South Slough or Coastal Frontal streams. The threat of this tiny (3-6 mm long) invading snail is significant. According to the Oregon Department of Fish and Wildlife mud snails are known to reproduce quickly and in huge quantities. In Montana, for example, researchers have reported mud snail densities as high as 750,000 snails per square meter. Mud snails have the potential to overwhelm the biological systems in coastal freshwater streams. As with AP, there’s concern that mud snails will displace invertebrate communities, disrupting food webs that support native fish, including trout and salmon to the detriment of recreational and possibly commercial fishing. Wetland habitats such as salt and freshwater marshes are not immune to non-native species with a preference for environmental conditions somewhere between aquatic and terrestrial. Indeed, even ditches and swales are frequently acceptable places for water-loving invasive species. One such species is purple loosestrife (Lythrum salicaria), originally a showy ornamental planted by beekeepers to attract honeybees, but which likely has been transported via ship ballast as well. A tall (to 7 ft.), prolific seed producer (2-3 million seeds per plant), it spreads quickly and is now widespread in freshwater wetlands on much of Oregon’s south coast and elsewhere in the state. This extremely invasive plant can ultimately change how a freshwater wetland functions by crowding out native vegetation and changing marsh hydrodynamics, and can negatively impact food webs of juvenile salmon (Grout et al. 1997). This species’ natural predators (Galerucella beetles and Hylobius root weevils) in its native lands of Europe and Asia have been employed in the United States as biological controls. Since 1999, the Coos Watershed Association has partnered with private landowners and federal and state agencies to locate, control, and monitor purple loosestrife infestations on over 400 acres of land in Coos County with manual removal and release of these natural predators. It typically takes 5 to 10 years before the bio-controls can effectively reduce the infestation size, but their continued presence at the site is believed to act as insurance against future invasions. Purple loosestrife has been found in only one location within the Partnership for Coastal Watersheds project area (a small site on the northeast corner of the South Slough watershed). That infestation is being addressed by South Slough Reserve and Coos Watershed Association personnel. Another troubling invasive marsh plant that fortunately still remains only a threat to the estuarine habitats in the Coos estuary is smooth cordgrass (Spartina alterniflora). Native to US east and gulf coast salt marshes, this salt-tolerant clumping grass forms expansive grassy meadows in low intertidal areas. If established, this invasive grass has the potential to significantly change Oregon’s mudflats and salt marshes as it has in other US west coast estuaries (e.g., Willapa Bay, WA, San Fransisco Bay, CA) where it has become the bane of public lands managers and shellfish growers alike. This species should not be confused with California cordgrass (Spartina foliosa) which is native from California to northern Mexico. Other non-native Spartina species, including Spartina densiflora, Spartina patens, or Spartina anglica found in other estuaries along the US west coast, are also a threat to salt marshes on Oregon’s south coast. Luckily, the Coos estuary has remained free of these invaders. We did have a Spartina scare in the mid 1990’s when propagules of smooth cordgrass were inadvertently imported by planting contractors to a constructed tidal wetland mitigation site at the mouth of South Slough. 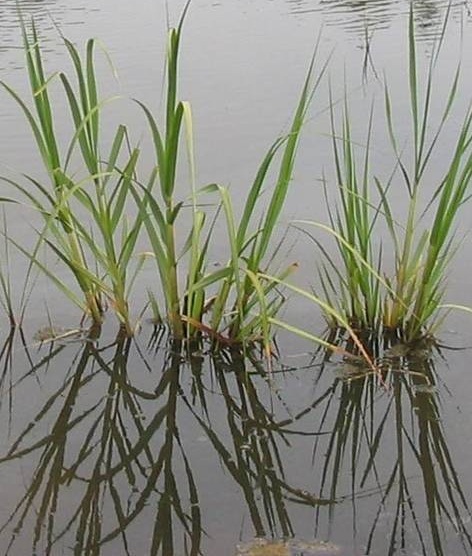 The cordgrass plants, which ultimately grew into two large circular clones, were not noticed until 1998, after which South Slough work crews started removing the invading plants. The plants were finally removed in full in 2002, 2003 and 2004 when they were positively identified as Spartina alterniflora by Portland State University and University of California, Davis staff. Since the invasive Spartina plants never produced seed heads, the chances that Spartina will become reestablished at the site are virtually zero. South Slough staff checks the site each growing season. Many terrestrial non-indigenous species gain a foothold by exploiting marginal habitat afforded by disturbance, such as excavation or over-use (as seen in excessively grazed pasture). The ability of non-indigenous vegetation to survive in less-than-ideal conditions, often coupled with multiple means of reproduction (e.g., having copious, long-lived, broadcasting seeds and tenacious rhizomes), means these species are well-suited to proliferate along with disturbance and over time are positioned to invade nearby environments occupied by the local competition. A ready supply of seeds combined with continuously rolling tires means ample opportunity for many introduced species along transportation corridors coast to coast. 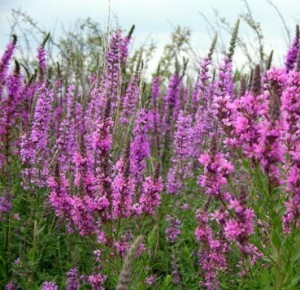 As discussed previously for purple loosestrife, some non-native plants are intentionally introduced because of aesthetic or other uses for people and agriculture. Showy flowers encourage people to cultivate plants in their gardens to attract bees and other pollinators; some of these, such as orange hawkweed (Hieracium aurantiacum) and purple loosestrife, proliferate beyond where they are planted and become invasive problems for the local ecology when they out-compete and exclude other plants. Even grasses such as reed canary grass (Phalaris arundinacea) that were introduced for livestock grazing and soil stabilization can replace diverse native plant communities and exclude them over large expanses in disturbed or perpetually wet environments such as wetlands and roadside ditches. The unintended consequences of these introductions include decreased community diversity and diminished ecosystem function, and can have ripple effects throughout a region as habitat quality decreases and wildlife adjust or leave these areas. One such intentional introduction negatively affecting the South Coast region of Oregon is common gorse (Ulex europaeus). Gorse, a very spiny densely limbed shrub that grows quickly in disturbed, open areas, and can quickly render land useless for people, livestock, and forest regeneration, was brought to the Bandon area in the late 1800s from Ireland. Gorse plants are very prolific and their seeds are extremely long-lived and resilient, so re-infestation continues to be a problem long after plants are removed. But perhaps its most insidious feature is its high oil content. Gorse is directly implicated in the fire that destroyed Bandon’s commercial district in 1936, reacting to water as a grease fire does by splattering and spreading to surrounding areas. Gorse seeds germinate aggressively after fire, and stems re-sprout quickly. Gorse has become established along the Pacific coast from the Bandon area south into California and as far north as British Columbia, and is presently considered “widespread” throughout much of coastal Oregon. Gorse has been found in localized patches north of Charleston and south of Hauser in the rural and urban lowland surrounding Coos Bay and North Bend. The Coos Watershed Association was recently awarded two years of grant funding to eradicate all known infestations in this area, and in 2011 and 2012 sponsored herbicide application on 17 small infestations that are now controlled. The Coos Watershed Association’s success illustrates the importance of early detection and rapid response for the control and eradication of any invasive species, and with continued vigilance the Coos Bay area will remain gorse-free. The difficulties in controlling and eradicating well-established gorse populations will remain a challenge for Oregon and the Pacific Northwest, but the significant threats it poses to economy and ecology—be it fire hazard, decreased opportunity for recreation, reduced property values, or impeded reforestation and agricultural production—give much impetus for continuation of these efforts. The knotweed species (Giant knotweed, Fallopia sachalinense; Himalayan knotweed, F. polystachyum; and Japanese knotweed, F. japonica) are a trio of extremely tenacious plants, forming dense stands that shade out native vegetation along rivers and roadways and inhibit forest regeneration along Oregon’s Coast Range, including the South Coast region. These plants are large, reaching 8 to 13 feet in height, readily spreading through rhizomes and seeds. Once established, knotweed infestations can be very difficult to eradicate. Mowing and hand removal can result in fragmentation of rhizomes from which new plants arise, so such removal efforts may aid in their spread rather than eradication. These plants can also spread during flooding of rivers and streams, when plants and rhizome fragments are carried downstream. Knotweed species are a problem because they exclude native vegetation and are not consumed by any herbivore. However, beavers can exacerbate knotweed infestations when they gnaw on fresh stems and use them to build dams. 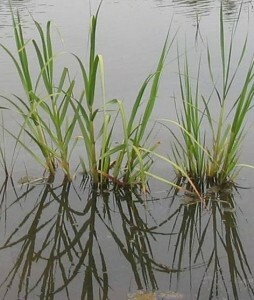 During winter flood events, these stems may float up or down river with the tide, spreading the knotweed far and wide. Knotweed’s effects on riparian habitat are so onerous they have earned special focus on Oregon’s South Coast. 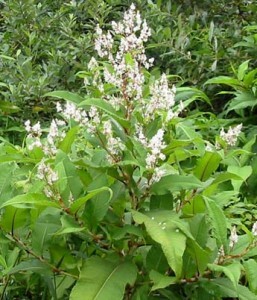 The Coos Watershed Association provides free herbicide application to knotweed infestations for any landowner within the watershed’s boundaries, and to date has successfully worked with 28 landowners on the Coos River to control the spread of these species. Since 2008, the infestation has been effectively reduced by 75% from 12 acres to 3 acres. As with many invasive species, education and involvement of landowners and continued vigilance by all is key to mitigating knotweed impacts and restoring riparian areas to their fully functioning condition. The presence of nutria (Myocastor coypus) is a growing problem on Oregon’s south coast. Nutria are beaver-like semi-aquatic rodents that were introduced to several states as early 1899 for the fur farming industry. They were introduced in Oregon in the 1930s. Nutria often escaped into the wild from fur farms and were also set free when farms failed. Nutria are present in the South Slough watershed. In the wild, nutria activities such as feeding and burrowing cause damage to farm and ranching operations, including weakening of earthen dikes constructed to prevent developed lands from flooding. Nutria can also transport parasites and pathogens transmittable to humans, livestock, and pets (Sheffels and Sytsma 2007). Nutria can be aggressive animals which means that in urban settings there is increased potential for conflicts between nutria and humans or between nutria and pets. In addition, due to their aggressiveness, nutria are known to drive beavers out of areas that beavers have long inhabited. With beaver activity now valued for adding needed complexity to aquatic and riparian habitats in the Pacific Northwest (juvenile salmon habitat in particular), there is concern that the spread of nutria will result in the degradation of salmon habitat. And in some cases reverse the recovery of habitats where costly restoration projects have been implemented. The Oregon Aquatic Nuisance Species Management Plan lists nutria as a management class 3 species, which means that nutria is well established in the state and that nutria are causing negative impacts throughout the state. 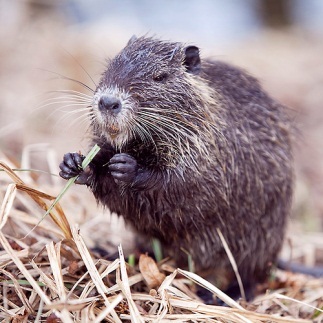 The Center for Lakes and Reservoirs Environmental Science and Management Program is working to provide the framework for a regional nutria management plan and will convene a regional nutria management workshop, a distribution map of nutria in the Pacific Northwest, and a study of the ecological and economic impacts from nutria damage. For more information go to the Portland State University Guide to Aquatic Nuisance Species Research. International and domestic trade and expanding recreational travel have over the last century provided relocation opportunities for many plant and animal species. These new introductions usually occur inadvertently, as when organisms hitchhike on ship hulls or imported produce. Some species, however, are introduced to a new environment intentionally as with some recreational fish species and ornamental plants. Either way, introductions of non-indigenous organisms and plant life to terrestrial and aquatic environments have had far-reaching effects on local ecology and economies the world over. Often these effects are negative, and impacts to food webs and habitat integrity are not welcome. The problem arises when introduced species find themselves at a competitive advantage in their new environment, as when no local predator or herbivore is present to keep their numbers in check and competitors with whom they co-evolved are absent. Plants and animals exist in equilibrium within niches in their native communities, but when unleashed in a new place in which they are physically compatible, some can out-compete indigenous species and/or create new niches and thrive to the detriment of local communities. While in some cases any advantage is short-lived and the local communities adapt to and suppress the new species, in other instances the invader is nothing short of disruptive and destructive to the local ecology. In turn, local and regional economies can suffer in myriad ways. Invasive species introductions are usually associated with human activity, either directly or indirectly. Corridors frequently traveled by people, such as shipping routes or highways, are frequently characterized by a diverse range of introduced species when both small boat and large ship hulls and vehicle tires or treads provide transportation of organisms to new areas. Disturbance due to construction and intensive agriculture can disrupt and modify habitat in ways that give non-indigenous species a niche to exploit; likewise, having showy flowers can impel well-meaning people to encourage establishment of certain harmful plants. While a weedy roadside may not appear harmful, the cumulative effect of the invasive species problem is as diverse as it is immense: non-native species are implicated in the listing of 42% of endangered species, including salmonids (Sanderson et al. 2009). Whether crowding out cultivated species, overgrowing shellfish beds, adding to agricultural workloads, or impeding re-growth of harvested forests, non-native species cause great harm to the economy—be it local, regional, national, or global. This summary has focused on selected invasive species currently affecting or likely to affect Oregon’s South Coast region, a region characterized by high levels of international shipping, large-scale forestry, agriculture, aquaculture, and diverse fisheries, all of which are prime vectors for invasive species of all stripes. Concerned citizens and several organizations in this region actively educate the populace and pursue eradication and prevention of a wide range of exotic species (especially terrestrial species), including broad-scale government agency programs such as the Oregon Department of Agriculture’s Noxious Weed Program to non-governmental organizations such as the Coos Watershed Association. While there are hundreds of invasive species currently present in Oregon, there is general consensus among managers regarding priority species, such as the Oregon Invasive Species Council’s 100 most dangerous invaders to keep out and the Oregon State Noxious Weed List. Behrens Yamada, S., B.R. Dumbauld, A. Kalin, C.E. Hunt, R. Figlar-Barnes, and A. Randall. 2005. Growth and persistence of a recent invader Carcinus maenas in estuaries of the northeastern Pacific. Biological Invasions 7:309-321. Grout, J.A., C.D. Levings, and J.S. Richardson. 1997. Decomposition rates of purple loosestrife (Lythrum salicaria) and Lyngbyei’s sedge (Carex lyngbyei) in the Fraser River Estuary. Estuaries 20: 96-102. Oregon Department of Environmental Quality (ODEQ). 2010. Shipping transport of aquatic invasive species: A report prepared by the Oregon Task Force on the Shipping Transport of Aquatic Invasive Species, for the 2011 Oregon Legislature. Portland, Oregon. 81 pp. Laferriere, A.M., H. Harris and J. Schaefer. 2010. Early Detection of a New Invasive Mesogastropod, Assiminea parasitologica, in Pacific Northwest Estuaries. Report for the South Slough National Estuarine Research Reserve and the Confederated Tribes of the Coos, Lower Umpqua, and Siuslaw Indians. Coos Bay, Oregon. 163 pp. Proctor, C. and R. Thresher. 1997. The invasive history, distribution and abundance of C. maenas in Australia. Proceedings of the first international workshop on the demography, impacts and management of introduced populations of the European crab, Carcinus maenas: 20-21 March 1997. Centre of Research on Introduced Marine Pests, Hobart, Tasmania, Australia. Technical Report 11. Rogers, R. 2001. The green menace: the European green crab. Environmental Practice 3(2):93-95. Sanderson, B.L., K.A. Barnas, and A.M.W. Rub. 2009. Nonindigenous species of the Pacific Northwest: an overlooked risk to endangered salmon? BioScience 59:245-256. Sheffels, T. and M. Sytsma. 2007. Report on Nutria Management and Research in the Pacific Northwest. Report for the Center for Lakes and Reservoirs Environmental Sciences & Resources, Portland State University. Portland, Oregon. 49 pp.